My name's Jackbean and I'm a two-month-old male kitten. 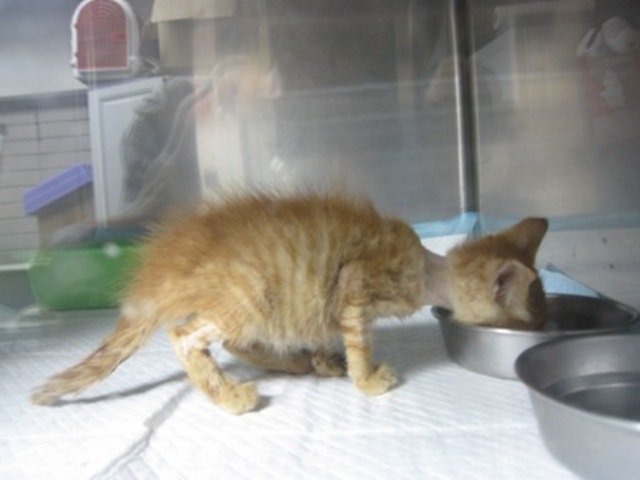 When I was rescued from the streets I was severely dehydrated and malnourished. I was just skin and bones. I've been receiving medical treatment for one month now and I'm doing much better. I've become more active and I love my food. I'm a curious guy and I love being with people. Please contact Animals Taiwan at 02-28338820, or email adoptions@animalstaiwan.org, if you can give me a loving home. Summer is upon us and things are heating up. We are continuing to work hard on our cat TNR program. We are gaining a lot of support from both volunteers and the government. We hope that once this program is fully operational and more results come in we can prove to the government that the next step should be the recognition of dog CNR. As summer does approach we have to change our centre times, we won’t be allowing dogs to be walked between the times of 12pm and 2pm. It is far too hot for both the dogs and the volunteers. 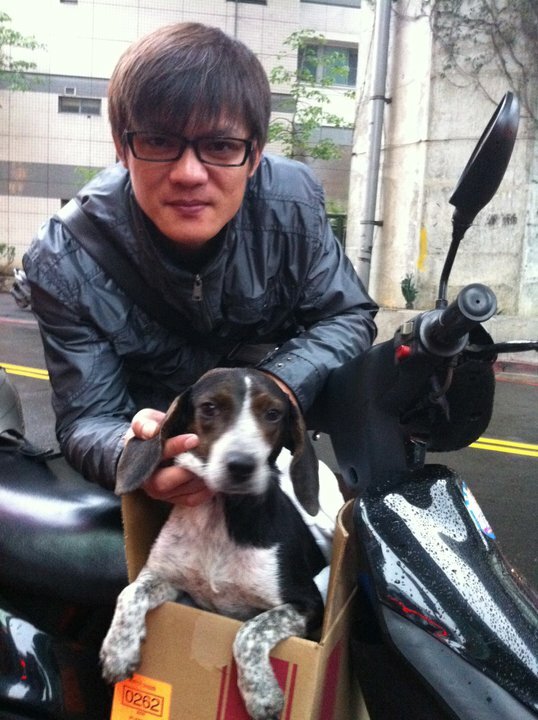 We are also putting on an Animals Taiwan Gala dinner on September 30th for the World Animal Day. If you would like to buy tickets for this event or would like to sponsor this event please contact Mayumi@animalstaiwan.org for more details. We’ve had a busy month of rescues and adoptions and we hope to continue to step up our adoption program. Victim number two of a hit and run is Prince. 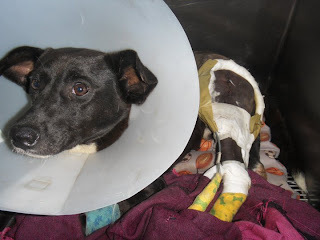 A guard called one of our volunteers, Mary, to inform her that one of the dogs she feeds had been hit by a car. Prince had run off and we weren’t able to find him. However, a couple of days later the guard called again to let us know that Prince had reappeared. We quickly went over and picked him up. He suffered from a broken leg and had received surgery. He’s recovering well and is ready for adoption. We were asked by the LCO clinic if we could take in two blind kittens. They suffered from Hepititus when they were younger which left one completely blind and the other blind in one eye. We knew they didn’t have any other option so we have taken them in and are looking for forever homes for them both. They are very healthy and smart little kittens and their blindness doesn’t hold them back at all. Helen and Keller are at our centre waiting for that special person. We received a call about a tiny puppy who was probably rejected by his mother in the mountains. We went to pick him up and found Oliver a 2 week old puppy whose eyes hadn’t opened yet and would require bottle feeding. He took well to the bottle and has grown into a healthy brave little boy. He’s now looking for that special home. 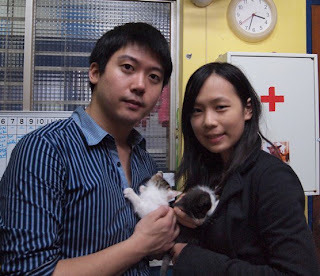 We were asked to help with 4 little kittens who were only a few weeks old rescued from a market area in Taipei. These little kittens were friendly and very curious. They came to our centre and were adopted very quickly and are now living happily in wonderful homes. 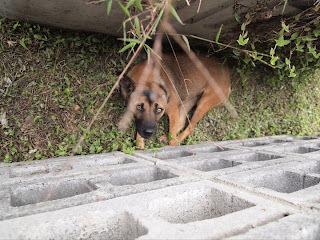 After receiving a call about 3 puppies (Sesame, Peanut and Soybean) living in a drain area we headed over there to see what was happening. Our first attempt at catching them failed but we didn’t give up and went back the following day to try again. Luckily with some help we caught all three puppies. They were living in a very dangerous place with the chance of getting stuck in the drainage system. 2 of the 3 puppies have been adopted already. Pumpkin was rescued during one of our TNR evenings. She had just had kittens and we decided that she was too friendly to put back on the streets. We kept her together with her babies until they were ready for adoption. All her kittens were quickly adopted into good homes. 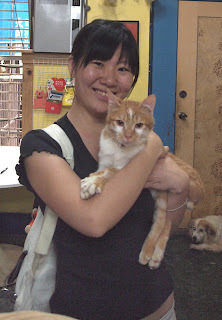 Now Pumpkin is at our centre waiting for adoption. Four cute puppies were dumped on a volunteer of ours, Mary. All four of the puppies were diagnosed with serious skin problems and have had to be kept separate from all other dogs. Unfortunately one of the puppies didn’t make it as he contracted a stomach bug as well and he just wasn’t strong enough to fight it. The remaining 3 are doing well and will continue to receive treatment until they are healthy enough to be adopted. Ah Hua, a young kitten, was also rescued on one of our TNR evenings. She was very quickly adopted and is now living a life of luxury. ChioChio a lovely dog was found abandoned near a farm. We helped to rescue her and get her spayed and vaccinated and she was quickly adopted and now lives happily in her new home. his and more and more vets are joining the scheme. We hope to have even more good news as times goes on. Adoptions As we’ve already mentioned quite a lot of our younger animals have been adopted. Two of the three drain puppies have been adopted, Sesame and Peanut, all 4 of the kittens rescued from the market area have been adopted, as have Pumkin’s kittens and Ah Hua. We are also really happy to announce that Eggmond our disabled cat who had a badly fractured pelvis and leg has been adopted. His new mommy loves him so much and he’s now living a life of happiness. Owa was adopted last month but was returned due to family issues. However, Owa being the lovely cat she is was quickly snapped up after a short return to the centre. Everything is going well and we wish Owa and her new mom all the luck in the world. 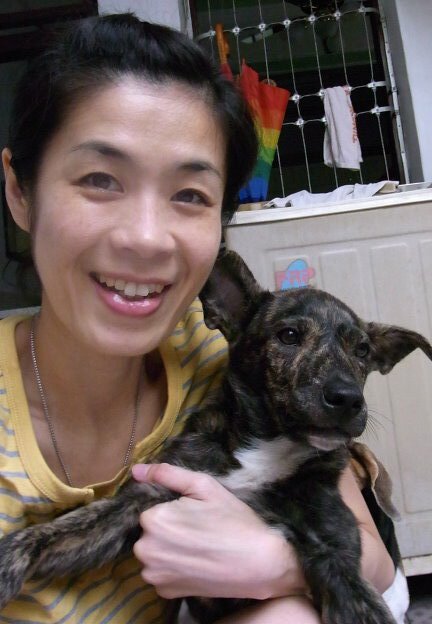 Mary, an AT volunteer, has been rescuing puppies and dogs for a while now, recently with the help of AT she has adopted out 10 doggies, (Spotty, Buddy, Junior, Bruno, Belle, Little Lady, Tiger and 3 other dogs from her community guard station). We’ve had a few returns from foster care which include Dahuahua a wonderful cat. She’s ready for adoption and we hope to see her find her forever home soon. Also Daisy our Rotwieler mix. Her foster family are returning to the States so Daisy has come back to us. She’s fallen in love with Mustard and all of our staff and volunteers have fallen in love with her. She is an extremely sweet natured young dog and we hope to find her that special home soon. We have enjoyed some really great group visits from Taipei European School. They have tried to come by once a week to learn about our centre and the work we do and take our furries for a walk. 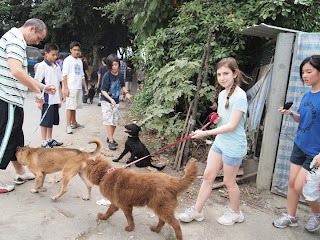 It is wonderful to see the younger generation enjoying volunteer work and learning about the care of our animals. It’s good to see what responsible adults they will grow into. Helen is a one eyed kitten. Blinded in one eye from birth. She is loving and friendly. She's looking for that speciall home. Please call our centre 02-28338820 or email adoptions@animalstaiwan.org if you are interested in adopting her. Keller, Helen's sister, is a blind kitten who was blind from birth. She is super friendly and loving and looking for a special home. Another Hit and run! The guy isn't so lucky as he has a broken jaw and a suspected fractured hip and leg. He will of course recieve all the proper medical attention and we hope he'll be back on the road to recovery soon. Seoul is a wonderful boy who can even be walked by a little kid because he is so calm. He is looking for a home. Please help spreading his story and contact Animals Taiwan 02-28338820 or email adoptions@animalstaiwan.org if you know any one who is interested adopting a dog. Hi everyone!! My name is Seoul. 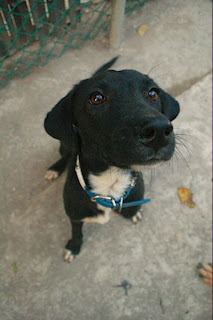 I am an adorable little dog who still looking for a nice home. I'm well trained and listen to whatever my leader tell me. So please come by and take a look at me. I love to go for walks! Update on 2011/11/5 : The rescuer decided to keep this little guy!! ^ ^ so he is not available now. I rescued a boy guinea pig in need of a home. He is going through puberty, so he is a little skittish, but he's fine once you have him out. His name is Pluffles. Attached is his picture. I will send him home with food and we have a cage that the owners can have, as well as a food bowl and water dispenser. 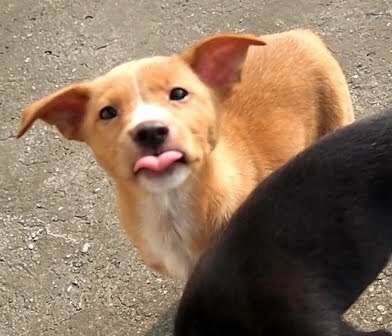 Four wonderful puppies were found in the mountains with no food and no safe place to hide. They are healthy and looking for homes. Please call 02-28338820 or email adoptions@animalstaiwan.org if you would like to come and see these wonderful pups. South: female, black. She was born around April 2011. East: male, brown. He was born around April 2011. West : male, tiger color. He was born around April 2011. North: female, black. She was born around April 2011. 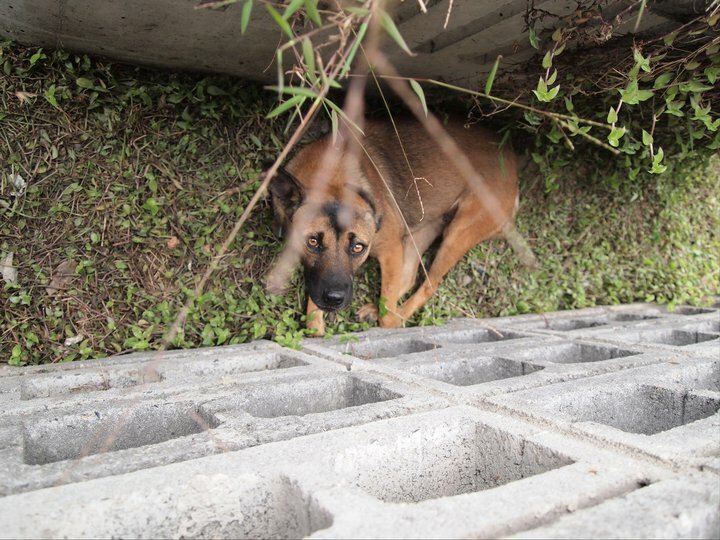 Peanut was returned to the Animals Taiwan rescue center today. 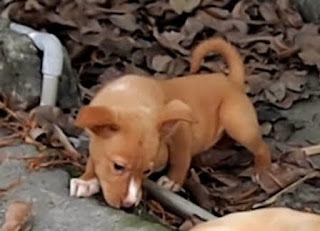 The adopters felt that Peanut was too shy towards them and, since they will move, they felt it was not a good time to adopt a puppy. Peanut is now looking for another loving home. Please help spread her story so that she can find a home soon. Peanut's photos are attached. North, South, East, and West are 4 puppies who were suffering from serious skin problems when they were rescued. 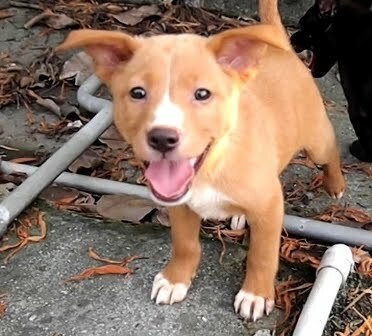 After receiving treatment at their foster home, they have grown into beautiful, healthy pups. They were born around April 2011. Please contact 02-28338820 or email adoptions@animalstaiwan.org if you can give these puppies a loving home. North is a black female. South is a black female. East is a brown male. West is a tiger color male.